Ever wondered how many Facebook Pages you “liked” over the time? I believe many of you did. All the memes from the past, your friend’s long time forgotten projects, closed pubs you used to like – not to forget all films, books or tv shows you listed in your profile yet before Facebook made Pages of them. And now all this just adds up to already too-full newsfeed of yours. But there’s a quick way to get rid of it. We present Manageyourlikes.com. So how many Facebook pages you ‘like’ and how to find out about them? The truth is Facebook doesn’t make this task easy. Go to your profile and see for yourselves. You will most probably realize that a vast majority of your liked pages is hidden in ‘Other Likes’. I have had over 800 of them. Try to find anything there – it’s a mess. What about making this much easier to handle? Showing you liked pages based on many different criteria? I know, one would say this must have been done many times before. But actually, it wasn’t or it’s not updated anymore or a bad UI makes it useless. 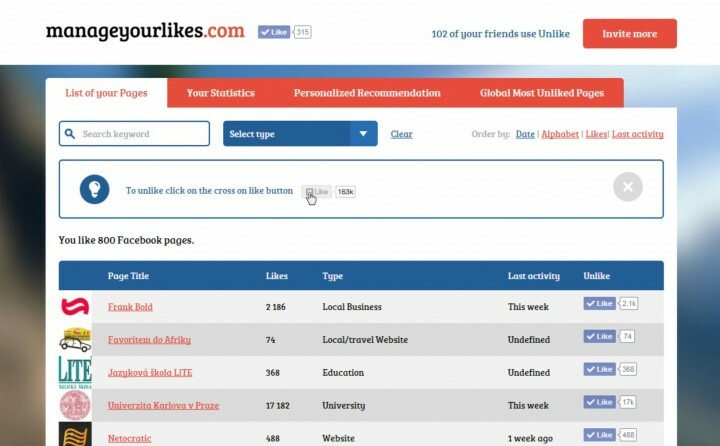 Our personal need was one of the main reasons to build the tool, named ‘Manage Your Likes‘. It’s a very simple (and free) web service which does what it says: it shows you what you like, it makes it easy to unlike pages and it even gives you personal recommendations what you might want to unlike. I suppose you are going to be surprised how many pages are inactive for a long time. In ManageYourLikes you can sort pages you liked based on different criteria, one of them being ‘activity of the page’ – and you will suddenly see those pages of politics that were abandoned after elections, friends’ projects that never made it or community pages long ago deserted. But you can also see the pages with least or most likes, or use the dynamic search. People all across the globe have tried the application and cleaning up your Likes might be a one of first good steps in the New Year We also hope that it might help you get better results in the Newsfeed. Facebook tries to guess what is actually important for us – in order to avoid over-feeding users with to much content share by Pages. One picture to really sum it up by Socialbakers. Socialbakers – how many posts by Pages seek our attention? What is the next step? More filters and statistics, but if the whole idea proves itself practical and useful for users (to gain a momentum among them), there’s also a business potential. 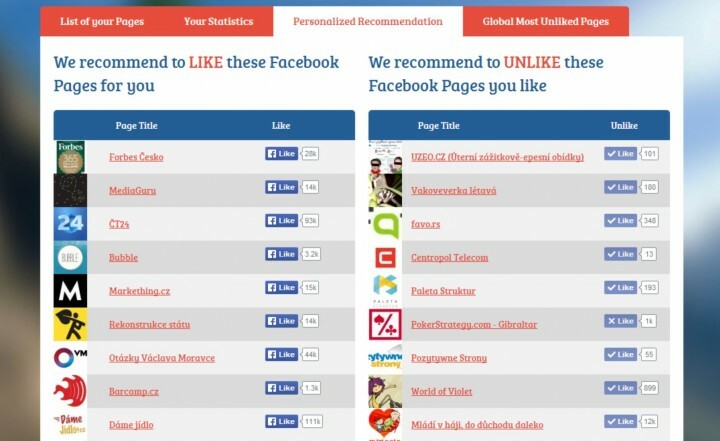 It might be actually interesting for brands to learn about their users: Who unliked your page? 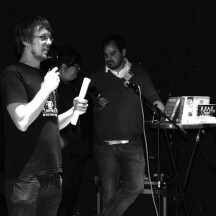 The team behind the project includes Adam Zbiejczuk, founder of BabelGuide.com and social media consultant (co-owner of influencer.cz agency) and Apploud Digital, Prague based agency specialized in custom Facebook applications.